Taylor was forced off in the 41st minute of the Birmingham Senior Cup win over West Bromwich Albion and although early indications are that it was an impact injury, boss Paul Holleran is keeping his fingers crossed that the damage is not more serious. 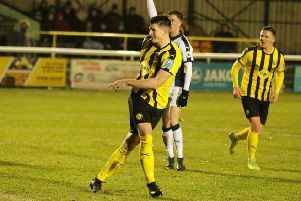 Connor Carson was handed his Leamington debut in midweek. With Kieran Dunbar loking set to be ruled out for at least six months after undergoing surgery on Monday, the loss of the former Tamworth midfielder would leave Brakes short in wide areas and Holleran admitted he is already thinking about reinforcements. “We went into the night with everyone on the pitch and Connor Gudger back and it was the only downside,” said Holleran. “I saw it first-hand and the early signs are that it is impact. “But with Kieran Dunbar going under the knife for a fracture under the kneecap and to repair some cartilage – he has got a long, hard six months ahead of him. “We’ll look at Connor and if there’s any damage that will leave us short in that area. The injury to Taylor took some of the shine off an impressive win over West Brom’s youngsters, with Jack Edwards and Colby Bishop both notching two apiece in the 4-1 victory. The reward for Brakes is a home semi-final tie against Aston Villa and Holleran admits the competition provides a welcome diversion from the stresses of the league. “It’s always enjoyable to get a home draw against one of the pro clubs. “We’ve got to see some good young pros at the ground down the years including Jack Butland, Nathan Redmond and Demarai Gray. “They’re enjoyable, different types of games. 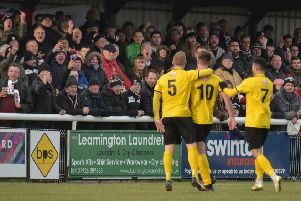 The midweek cup tie also gave Brakes a chance to blood youngster Connor Carson on the back of some impressive goalscoring form in the Leamington Sunday League and for the club’s Junior Premier League side. Carson came off the bench with 25 minutes to play and Holleran said the experience would do the youngster the world of good. “He’s a local lad and he’s doing really well for the youth team,” said Holleran. “It will have been a good experience for him. He’s trained well and with one or two players cup-tied it was a decent opportunity to get him on to the pitch. “It gives him a taste of what it’s all about. “And as much as we sign players it also shows those in the youth system that we look at our own. “There’s a massive step to be taken between the Junior Premier League but it gives guys an insight into what is required. Brakes return to league action tomorrow with the visit of Hereford. The Bulls sit just two points behind their hosts having tasted defeat just once in their last six under head of football Tim Harris and head coach Marc Richards. However, despite the closeness of the two side’s respective league positions, Holleran said the focus is not on distancing themselves from their visitors but getting closer to 40 points. “They are another good side and Tim is finally getting them playing the way he wants. They’ve picked up a couple of good wins at Blyth and at York and he has made some good signings. “It promises to be a good occasion, they’ll come in numbers and it should be a great atmosphere. “We’re not looking at it as going one on one with Hereford, though, we’re looking it as a chance to get closer to breaking through the 40-point barrier.